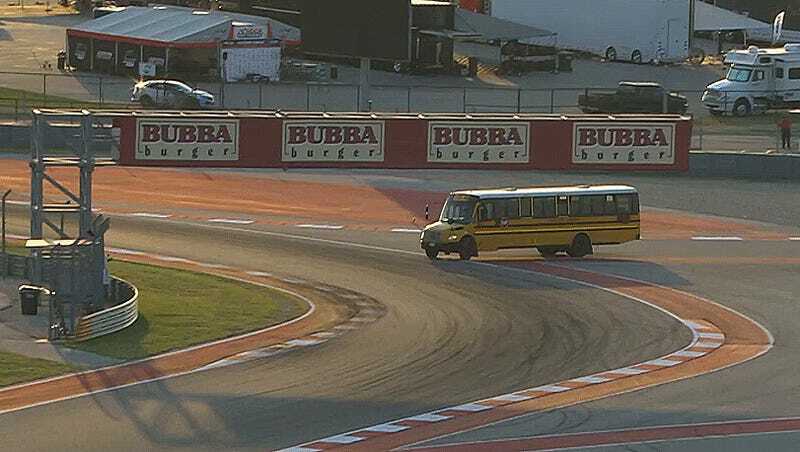 A bus driver took a wrong turn yesterday and accidentally ended up out on track at Circuit of the Americas’ Turn 6, halting a Formula 4 support race for the Lone Star Le Mans weekend. Oops! Buses are frequently used to pick up marshals and give tours at the track, and given that it was the end of the day, it was almost time to pick up everyone from the various marshal stands around the track. The Formula 4 United States Championship race was supposed to end at 7 p.m. local time, and that’s about when the bus wandered out onto track. It wasn’t time to make that run yet, though—that F4 race was still running. The race had to be red flagged while the bus was helped off the circuit. Fortunately, the bus was empty save for its driver and no one hit it while it was on its surprise detour. The Formula 4 race was restarted shortly after the bus was safely back behind the fence.